Vrrroooom! Vintage Runs in the Family Part II | Oh, for the Love of Vintage! Ever since I can recall, my father has been buying, selling, restoring and driving antique cars. He’s owned so many vintage cars over the years that I can’t even remember them all, and I doubt he can either! *lol* I thought it being Father’s Day, this was a great opporuntity to chat with Dad about his love of antique cars. The little I know about cars, I learned from my father. Though, ironically this vintage gal doesn’t know how to drive! An oversight, perhaps. It all started in 1967, when my father and mother were out for a drive. During the journey, my father spotted a racing green 1964 Austin Healey Sprite and just knew he had to have it! And so, he did just that – he bought his first British car and the rest is history! Let’s look at a photo of this car, for it plays a key part in the family history (my parents went on their honeymoon in this car). 🙂 Isn’t it cute? Let’s sit down with the Best Dad in the World, to find out more about his love of antique and vintage cars, shall we? Black Dahlia: Happy Father’s Day Dad! What are your favourite kind of cars? 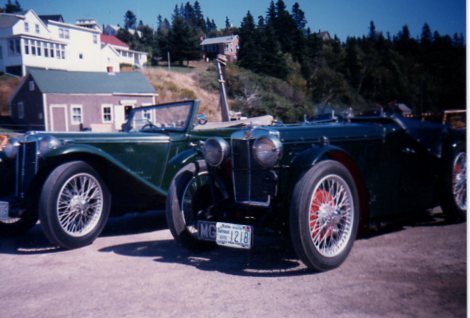 Best Dad in the World: My favorite cars are British from the 30s to 60s. 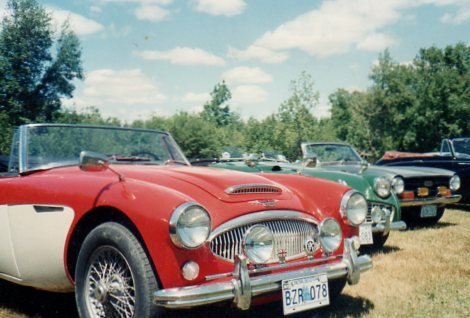 My favorite make of car is the Austin Healey which were made from the mid 50s to 1967. Black Dahlia: When did you begin restoring antique cars? Do you restore the inner workings and outer (body/paint job)? Best Dad in the World: I always have done my own mechanical work and leave the body shops do the exterior. Black Dahlia: How many antique cars have you owned? How many have you restored? Best Dad in the World: A few cars I can remember are 1. Austin Healey Sprite 2. Three Austin Cambridges 3. Three Austin Healeys 4. Austin 1800 5. 1932 MG J2 6. four MGA’s 7. 1967 MGB GT 8.1979 Catherham Super 7 9. Triumph TR2, TR3A, TR4 and a GT Plus 10. 1959 Jaguar MK11 and maybe five or more I cannot remember. The restorations have been in the last ten years because back in the old days we just fixed them up to drive not to win shows or look like new. Black Dahlia: Wow, that’s a lot. I don’t remember all of those! 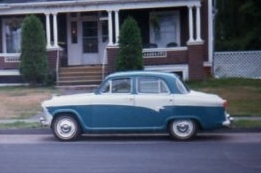 I really did love the Blue & White Austin Cambridge. Wish we’d kept that one. Maybe it could have been my car! 😉 Did you sell a car in the past that you wished you’d kept? 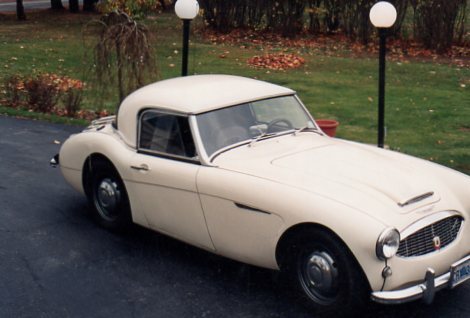 Best Dad in the World: I would like to have the white 1957 Healey and the 1979 Super 7 back. Our Austin Cambridge, wish we still had it! Black Dahlia: I remember the Super 7, that was a cool car! What is your dream antique car (if money was no object)? 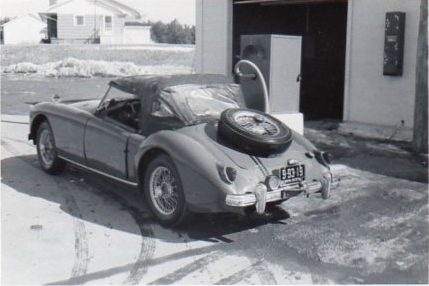 Best Dad in the World: My dream car is the one I have now the 1967 Austin Healey MK111. Black Dahlia: What do you like best about antique cars Dad? 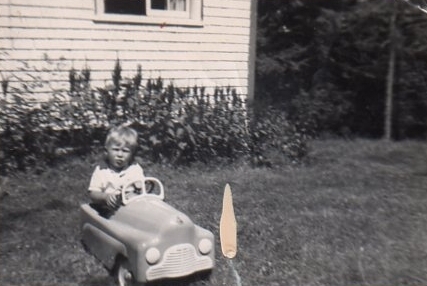 Best Dad in the World: Antique cars have beautiful lines and are a work of art. The sound of the exhaust and the smell of the leather interior keeps me young. And I love working on them to make them run the way they should! Black Dahlia: Thanks Dad for taking the time to chat about cars with me and for scanning all these amazing photos! Oh, and last but not least, for having ME! ha ha. Love you and let’s go for a spin! Er! Wow! Never mind ‘best dad in the world’ – how about COOLEST dad in the world?!!!! 😉 I loved this interview. My dad has also been into mechanics all his life. He built a kit car years ago and has always had motorbikes (he builds steam locomotives too – just another little hobby of his!!!) We used to holiday at the Isle of Man TT races back in the 70s. All my heroes back then were motor cycle champions like Mike Halewood and Ron Haslam. Awww, how wonderfully sweet! You’re so, so lucky to have an awesome father and to share in a mutual passion for the past. Thank you (both) for this enjoyable article, it was a joy to “meet” your dad. This was such a great post and it definitely reminded me of my dad. I can’t retain all the info he’s taught me about antique cars over the years, but that was not for lack of trying! Thank you all so much! Now I know why I love blogging so much, it’s interacting with all of you! Jessica, thanks hun! It was really fun to interview my dad and create this post. Though, it’s made me EVEN more homesick for my family! Itsallourvault, I can’t retain the information either! ha ha. Hope you had a great Father’s Day!